Make no mistake about it: I am alarmed at the accelerating crisis in Washington, D.C. Some Republican lawmakers, such as U.S. Sen. Ted Cruz of Texas, might believe that “no one outside the D.C. Beltway cares” about Russia and Donald J. Trump’s alleged involvement with the nation’s pre-eminent adversary. I, though, do care about it. So do millions of other Americans, senator; you’re just not listening to us. Does my alarm extend to my fear for the resilience of this system of government of ours? No. Not for an instant. I remain an eternal optimist that we’ll get through all of this, no matter what the special counsel’s report reveals to us. Robert Mueller could exonerate the president of any wrongdoing. Or he could lay out a smorgasbord of questions that call into fact-based suspicion about the president’s fitness for the job. 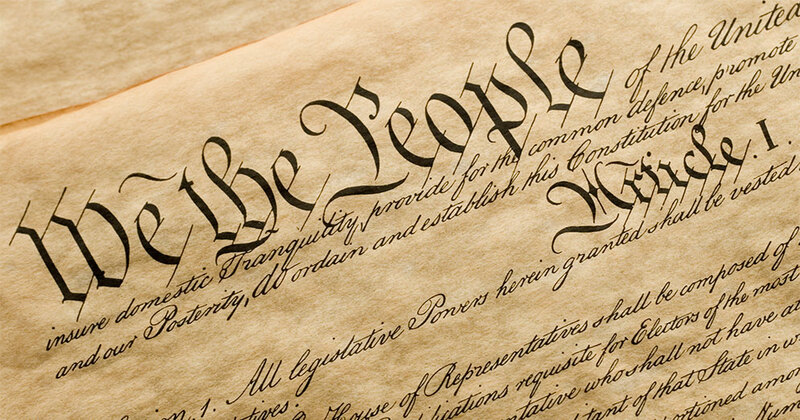 Whatever happens, I feel compelled to remind us all that this country has survived equally serious — and more serious — crises throughout our history. We endured the Civil War; we engaged in two worldwide wars; we also endured a Great Depression; we have watched our political leaders gunned down by assassins; Americans have rioted in the streets to protest warfare; we witnessed a constitutional crisis bring down a president who resigned in disgrace; we have entered an interminable war against international terrorism. Through it all we survived. The nation pulled itself together. It dusted itself off. It collected its breath. It analyzed what went wrong. The nation mobilized. Our leaders have sought to unite us against common enemies. We responded. Here we are. The special counsel is preparing — I hope — to conclude a lengthy investigation. There have been deeply troubling questions about the president’s conduct. One way or another I expect the special counsel, Robert Mueller, to answer those questions. They might not be to everyone’s satisfaction. Indeed, I can guarantee that the findings will split Americans between those who support the president and those (of us) who oppose him. But we’re going to get through it. We might be bloodied and bruised. It might take some time to heal. The founders knew what they were doing when they crafted a government that they might have known — even then — would face the level of crisis it is facing today. Randall County Judge Ernie Houdashell’s mission is accomplished. A piece of an iconic historical treasure is now in display at the Texas Panhandle War Memorial. 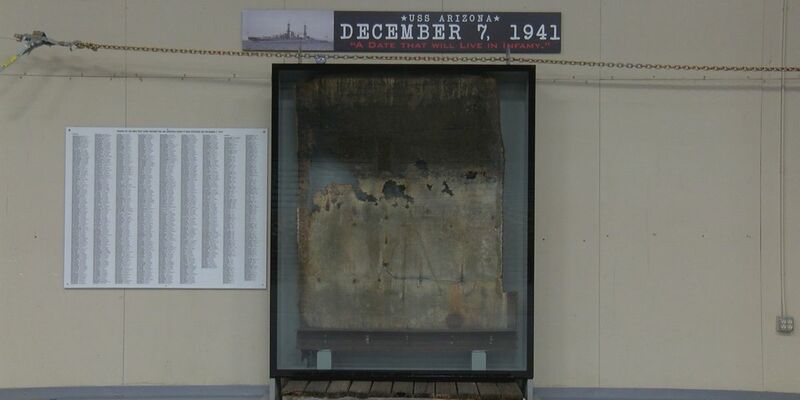 It is a small section of the USS Arizona, the World War I-era battleship that was sunk 77 years ago today at the attack on Pearl Harbor, Hawaii, by Japanese fighter pilots. The event thrust the United States into World War II. More than 1,000 men died on the Arizona. Houdashell made it his mission to bring a piece of the sunken ship to Amarillo, to display it at the War Memorial, which honors the men from the Texas Panhandle who fell in battle in conflicts dating back to the Spanish-American War. He meant to welcome the display on Pearl Harbor Day, when the nation remembers the event that mobilized the nation into a new era of industrial and military might in the fight to quell the tyrants in Europe and Asia who sought to conquer the world. I am delighted that Ernie Houdashell accomplished his mission, just as he worked to bring the F-100 Super Sabre jet fighter and the UH-1 Huey helicopter — both Vietnam War relics — to the War Memorial grounds at the site of the former Randall County Courthouse Annex in south Amarillo. These displays are important to Houdashell, who served two tours in the Vietnam War himself and who wears his love of country on his sleeve. Indeed, they are important to all Americans, all of us who understand the sacrifice made by those who fell in battle. The names of the Panhandle sons who fell are inscribed on the stone tablets that stand on the memorial grounds. They now are accompanied by yet another historical artifact, a reminder of the horror of the bloodiest war the world has ever seen. May it stand as the worst the world will ever see. I am not a Franco-phile. I don’t live, breathe or think of all things French. However, I do want to ask the president of the United States to cease with the France-bashing as he keeps tweeting messages in response to criticism coming from our nation’s old and (usually) reliable ally. Macron, the French president, doesn’t like the nationalistic tone coming from Donald Trump. 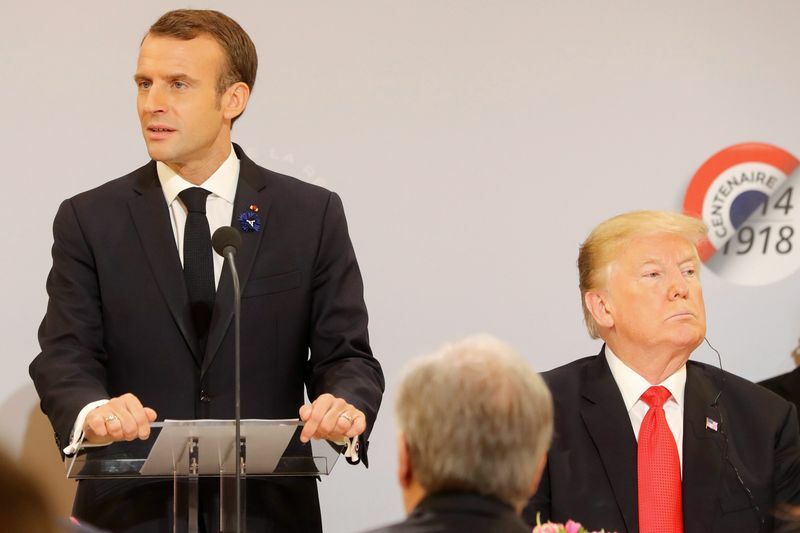 He said so publicly in remarks over the weekend at a ceremony commemorating the 100th anniversary of the end of World War I.
Trump decided to return fire with the tired refrain we hear about France’s participation during both world wars. I want to defend the French for a moment. First, I am acutely aware that French forces were defeated by Germans in both global conflicts. However, I also am acutely aware of the resistance that French citizens mounted against the occupying forces. That was especially true during World War II. French fighters terrorized Nazi soldiers repeatedly after the fall of Paris in 1940. Yes, the French set up a pro-Nazi government in the southern part of the country. However, the “Free French” forces played a significant role in major military campaigns as the Allies began their counterattack against the Third Reich. Normandy? North Africa? The French fought alongside their allies from the United States, Canada and Great Britain — and the Poles, Greeks, Dutch, Norwegians and Belgians. One more point, as long as we’re discussing historical events. It has been argued that the United States of America wouldn’t even exist without France’s money and military support during the American Revolution. France has been ridiculed over many decades. Do the French owe the United States for helping free them during World Wars I and II? Certainly. The gratitude, though, ought to go both ways. Thus, the criticism from the U.S. president directed toward the French president is unfair, childish and gratuitously petulant. This is no flash, no great scoop. Human beings have been going to war with each other since the beginning of time. Certainly since the beginning of recorded history, which also goes way back. Thus, when human beings find it impossible to settle disagreements without resorting to extreme violence, we’ll always have veterans. Men and women are answering the call of their governments to take up arms. I join many others in wishing we could end all war. However, that is perhaps the most unrealistic expectation one can have. I detest having to say such a thing, but you know it’s true as much as I know it to be true. For as long as lunatics continue to walk the Earth, for as long as there are tyrants or would-be tyrants who seek to subjugate other human beings, there will be war. The same can be said of the prospect of ridding our world of losers who assassinate world leaders. Indeed, the murder of a central European head of state ignited the War to End All Wars in 1914. Today, we are commemorating the 100th anniversary of the end of what became — sadly, tragically — as World War I. There would be another global conflagration in the 20th century. And others have followed since then. They all have produced heroes. They also have turned men and women into veterans. They were called to duty by their government or they volunteered to serve, they chose to sacrifice large segments of their life to defend our nation … or any nation, for that matter. And, most certainly, many of them volunteered to sacrifice their own lives in their nations’ defense. We must honor them, all of those who served. Not just on Veterans Day, but every single day! Can we ever end international conflict? Realistically, no. Instead, we will continue to honor those who defended us — from ourselves. We’ll do so until someone finds a way to change human behavior. Donald J. Trump’s penchant for passing the responsibility buck remains intact. 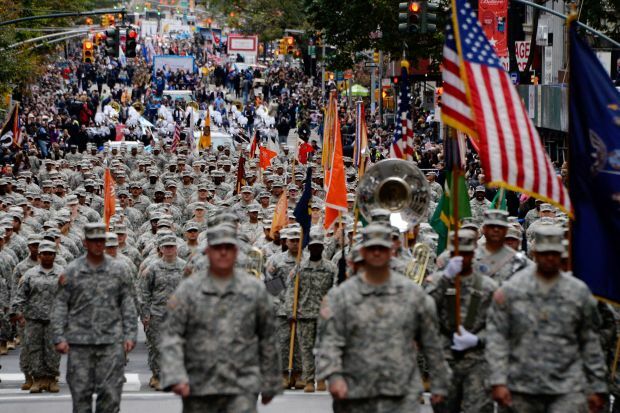 The president wanted to stage a military parade down Pennsylvania Avenue ostensibly to honor veterans on the 100th anniversary of signing the armistice that ended the War to End All Wars. Then the cost of the parade came in. He estimated the cost initially at $12 million. But wait! The cost escalated to an estimated $92 million. Trump called it off, suggesting he might try again next year. Phooey! Who’s to blame? Trump lays it at the feet of Washington, D.C. officials who — one can only surmise — comprise Democrats intending to stick it to the Republican president. As The Hill reported: “The local politicians who run Washington, D.C. (poorly) know a windfall when they see it. When asked to give us a price for holding a great celebratory military parade, they wanted a number so ridiculously high that I cancelled it. Never let someone hold you up! I will instead attend the big parade already scheduled at Andrews Air Force Base on a different date, & go to the Paris parade, celebrating the end of the War, on November 11th,” Trump wrote. Or, how about this, Mr. President? How about putting some of that money into helping veterans who need primary medical care, or who might need counseling to deal with the symptoms of PTSD? Or, maybe you could suggest spending more to combat the alarming rates of suicide among veterans returning from combat duty in Afghanistan, Iraq or other trouble spots where we’ve send our men and women into harm’s way. What’s more, the president can stop laying blame on others and accept the reality that just maybe he low-balled the cost at the outset, not having an idea what such an ostentatious demonstration of military might would cost. Leave it to the inimitable Donald John Trump Sr. to do the seemingly impossible. Three men — all heroes from World War II — came to the White House recently to be honored for their exploits during the great conflict. So, what did the president do? With a thoughtless, careless quip he turned attention from the men and those who they represent and turned it onto himself for all the wrong reasons. He said he “liked” the men who stood with him in the White House. He then chided a member of the U.S. Senate who has said she, too, has Native American heritage in her background. 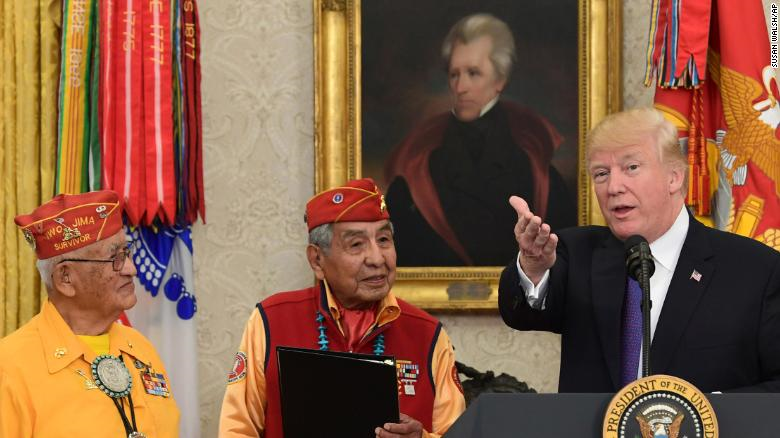 Trump just had to call Sen. Elizabeth Warren “Pocahontas,” which he has used for years to deride her claim. That’s what the media have been talking about, not about the men who served so heroically. The men are Code Talkers. They are of Navajo descent. They were deployed as Marines during World War II to communicate battle plans and intelligence in a language the Japanese couldn’t de-code. They were instrumental in several key Pacific Theater battles. CNN.com published a story chronicling the men’s heroics. The story notes that the use of Native American tongues in war began in World War I, when Choctaw soldiers spoke to each other to confound the Germans on the other side of the battle lines. But in the period between the world wars, the Germans figured out that language. The Navajo was more difficult to decipher. As CNN.com noted, it isn’t a written language. Therefore, the enemy was unable to figure what they were listening to when the Navajo Marines were communicating. They risked their lives. They fought for their country. Only 13 of the Code Talkers are still living. They all are old men who are suffering the usual ravages of aging. The president should have known better than to yank the spotlight from those heroes. He should have shown a semblance of class and grace as he welcomed these brave Americans to salute their commitment to their country. Indeed, if the president understood or appreciated anything about the sacrifice these men paid, he might have seen fit to keep his mouth shut about a political foe. Michael Grauer is a well-read student of history, which is a good thing, given his standing at the Panhandle-Plains Historical Museum in Canyon, Texas. The curator of art at the PPHM came to our Rotary Club today and delivered an enthusiastic talk about World War I, which he calls “the forgotten war.” Grauer has worked at the PPHM since 1987. That’s 30 years chronicling the Panhandle’s history and its contributions to global progress. WWI was called “The Great War,” or just “The War,” because no one ever thought there would be a second world war, Grauer said. How wrong they all war. But he added some details about the nature of the conflict that consumed Europe from 1914 until 1918 when, on the 11th hour of the 11th day of the 11th month of 1918, they signed the Treaty of Versailles. He told us that the Texas Panhandle contributed thousands of horses and mules to the war. The animals were used to haul artillery pieces, supplies and ambulance wagons. The average life span of the animals on the battlefield, Grauer said, was 10 days. They would be shot in the heat of battle and then left to rot on the field. “The stench of death was everywhere,” he said. 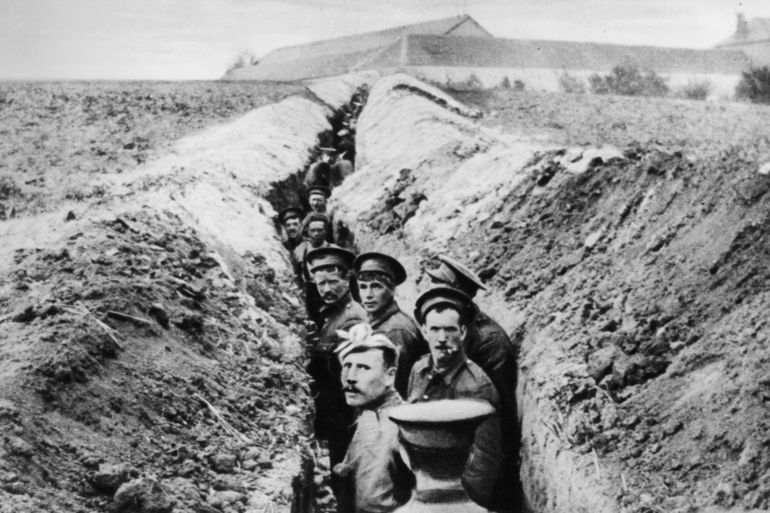 The men who fought in the trenches had their boots rot off their feet as they slogged through mud for weeks and months on end. The wagons used to carry supplies and evacuate the wounded from the field of battle would break down in the mud. All our WWI vets are gone now. I wish I could tell just one of them how much I appreciate what they did and salute them for the utter hell they endured fighting a 20th-century war with 19th-century technology. Grauer is right. I don’t think I’m going to grouse any longer about traffic holdups. I’ve written already about my immigrant grandparents. And I’ve told you how they loved their country — the United States of America — more than I can possibly measure. This picture is of three of them. The lady on the left is Katina Kanelis, my dad’s mother. 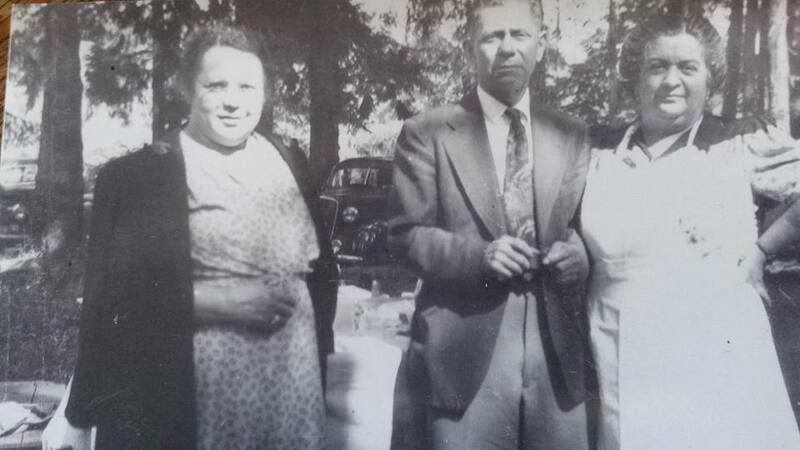 The gentleman is George Filipu and the other lady is his wife, Diamondoula Filipu; they were my mom’s parents. I want to share one quick anecdote about my grandfather. He came to this country during World War I. He had settled in Portland, Ore. He wanted to get into the fight, serving the United States. So, he enlisted in the Army. But before he could join the fight against the Germans, the war ended in November 1918. But a quirk in U.S. immigration law at the time granted him immediate citizenship upon enlistment in the military. None of them ever looked back. Who are the true-blue patriots? UK leaders want to ban Trump? 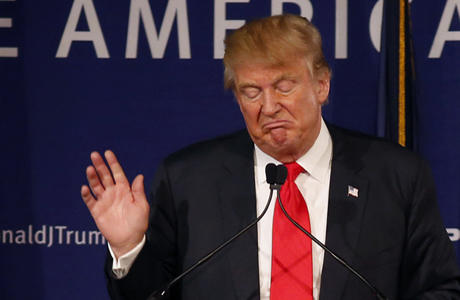 Donald Trump has insulted his way to the top of the Republican Party presidential heap. Suffice to say that if British Parliament members had a vote in this country, why, they would do all they could to keep anyone from endorsing Trump. The House of Commons today debated whether to ban Trump from entering the United Kingdom. It’s all in the wake of Trump’s call to ban Muslims from entering the United States, as well as plenty of other things Trump has said along the presidential campaign trail. To be honest, I don’t think that Parliament needs to debate this issue. Indeed, the decision rests ultimately with the British home secretary. Still, we’ve heard a snootful from the Brits about Trump. Trump doesn’t care who he insults. He should, at least in this case. Great Britain is arguably our most loyal ally on the planet. Sure, we shook off the bonds of the British Empire in the 18th century and then fought them again in the early 19th century. Since then? We have been side by side through two world wars, the Cold War and now in the war against international terrorism. What on Earth could be transpiring here if the Brits were to actually ban someone from entering their country if that certain someone happened to be elected president of the United States of America? I’m not predicting either event will occur: Trump’s election and the home secretary’s decision to ban him from entering his country. Does he care? Again . . . he’d better.